Atheneum Books for Young Readers, 9781442423657, 48pp. In this remarkable personal story, Arun Gandhi, with Bethany Hegedus, weaves a stunning portrait of the extraordinary man who taught him to live his life as light. Evan Turk brings the text to breathtaking life with his unique three-dimensional collage paintings. "Collaborating with first-time picture-book author Hegedus, Arun Gandhi recalls his own childhood experiences, relating the stories in an immediate first-person voice. Working in mixed media, with pieces of fabric clothing and hand-cut, hand-painted figures, Turk mixes carefully detailed renderings with abstracted expressions of emotional struggle, achieving a powerful balance. A personal portrait of a legendary figure." * "This first-person account presents Mohandas Gandhi through the eyes of his then–12-year-old grandson.... Turk’s complex collages, rich in symbolic meaning and bold, expressive imagery, contribute greatly to the emotional worldbuilding.... Never burdened by its message, this exceptional title works on multiple levels; it is both a striking introduction to a singular icon and a compelling story about the universal experience of a child seeking approval from a revered adult." 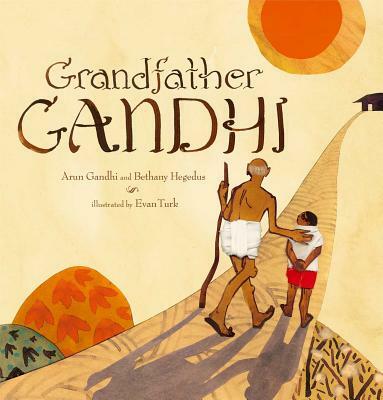 "Mahatma Gandhi, as seen through the eyes of one his grandsons, is depicted in this picture-book biography as a loving grandfather and a revered figure...an ode to a great man by an adoring grandson...memories of Gandhi himself are sharp and specific, lending an air of intimacy. The accompanying artwork is stunning, the use of mixed media collage is effective and beautiful, with varying perspectives and intriguing materials on display on every page. With so many biographies about Gandhi published recently, this one stands out for its unique point of view and gorgeous art, and makes a fine supplement to any collection." "Unusual for its child-centered and intimate portrait of Gandhi (we learn, for example, that he smelled like peanut oil), the graceful narrative is nearly outdone by the vivid mixed-media illustrations, rendered in watercolor, paper collage, cotton fabric, cotton, yarn, gouache, pencil, tea, and tinfoil. The cotton yarn, handspun on an Indian book charkha, gives the pictures such a three-dimensional look that one feels as though it could be plucked right off Gandhi’s spinning wheel. But it’s more than just an attractive effect—the yarn becomes a visual metaphor for anger channeled into light." "The grandson of Mahatma Gandhi tells this true tale of how he learned to use his anger to work for him rather than letting it take control of him. . . . The spare text in this magical, transformative anecdote is paired with mixed media artwork. . . . Turk brilliantly uses broader, thicker strokes and darker colors to show anger. By telling the story of Gandhi’s approach to civil disobedience in this manner, it becomes a relevant, approachable concept for youngsters today."